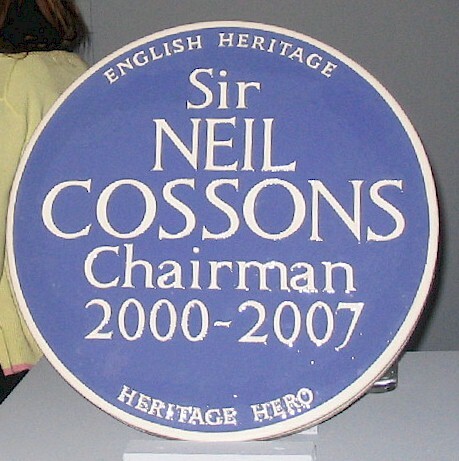 From school days in Beeston to life at the top of English Heritage is a very long journey but as Sir Neil Cossons retires this summer (2007)1, that is exactly what he can look back on. Not that it is likely that Neil will spend a long while resting on his laurels as his passion for the conservation of the heritage and the demand for his vision and dedication, is sure to keep him occupied even in retirement. Whatever he chooses to do, we wish him well. Born in Beeston in 1939, he was the son of Arthur Cossons - himself a pioneer in local history, way before it became as fashionable as it is today. It was the enthusiasm of the father that kindled in the young Neil, an interest in the remains of the past during the family’s regular expeditions, often by Barton’s bus ("were Barton’s buses really all different ? ", Neil has since wondered2 - a thought that can be readily echoed by all those who remember this local icon from an era still recalled by many.) These expeditions were to discover remnants of the past around the East Midlands - mills, canals, bridges, industrial remains of all kinds and, most of all, traces of forgotten turnpikes, one of Arthur’s particular interests. Perhaps not realising it at the time, Neil had already become aware of the significance of "place" - how the past had shaped the present and had impacted on the evolution of the landscape and how that past had a part to play in the development of the environment in the future. It was a concept that has shaped his career. Church Street was to be Neil’s first school and, much later, when writing in a forward to "Beeston Now & Then"6 he described his early life in Beeston and how it operated as a self contained community offering everything that was needed - "Mr Noble on Church Street cut my hair, shoes were bought from Mr Ablett, feed for the hens came from the poultry club and fuse wire from Applebee’s". Although a scholarship to Henry Mellish Grammar School7 took him a little further afield, there seems no doubt that these early experiences in Beeston, assisted immeasurably by a father whose passion for the history around him, were to have a lasting influence.8 Neil’s early insights into how the town worked were strengthened further during six summers working in school and university holidays as a porter at Beeston station, and observed how the railway carried large volumes of parcel traffic to support Beeston’s then bustling traditional industries. In due course, it was on to University of Liverpool - in a city that can only have intensified that perception of the contribution of the past to the present and of the need to carefully interpret and preserve the best - from where he graduated with a degree in Historical Geography. His career developed rapidly; after a short period as graduate trainee at Leicester Museum, he went on to posts in the Great Western Railway Museum in Swindon and then, in 1964, to Bristol Museum where he set up a new technology department. It was clear that his reputation was well established when, at the young age of 29, he was appointed deputy director of Liverpool Museum. Then, just a few years later, in 1971, he became the first director of Ironbridge Gorge Trust in Shropshire. During his 13 years in this post, this remarkable museum became a triumph at all levels. While maintaining a sound professional historical and conservational base, it had a popular appeal, making history accessible to a mass audience on a unprecedented scale - and transforming the economics of the area in the process. This was what he believed in passionately - the heritage of the "place" contributing positively to the present. The museum - and the concept - was a spectacular success and it continues to attract many visitors today. In 1986, after a brief term as Director of the National Maritime Museum in Greenwich he was appointed director of the Science Museum in London. His term there - longer than any previous director - lasted for 14 years, culminating in the opening of the Wellcome Wing in 2000. This was a demanding career but, during all this time, he has retained an interest in his home town, returning several times to support the local history society at its important milestone anniversaries and provided invaluable support, for instance, to the successful campaign to save Manor School - his and his father’s old school - from demolition. Throughout the country - and indeed, in other parts of the world - many conservation groups have benefited from his experience, wise counsel and great enthusiasm. Sir Neil received an OBE in 1982 in recognition of his pioneering work at Ironbridge as its founding Director. He was knighted in 1994. 1His retirement event was held in June 2007 at St Pancras Station - in recognition of Sir Neil's close involvement in the restoration of the station. hotel and the magnificent Barlow train shed - the new home for Eurostar. Click Here for pictures taken by Ernest Pollard at the time. The blue plaque (shown above, right), in the style of an English Heritage blue plaque, was presented to him on that occasion. The Cossons family home, at 38 Union Street, Beeston, no longer survives as a possibility for such a plaque as the house was demolished when Middle Street was widened. 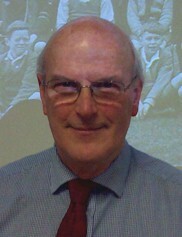 The photograph of Neil, shown top right, was taken in February 2009 when he delivered the Maurice Barley Lecture on the life of his father, to the Thoroton Society in Nottingham; he is shown against the background of an image of a class of his father's school. 3More recently known as Manor school and now restored, renovated and incorporated in a recent residential development. 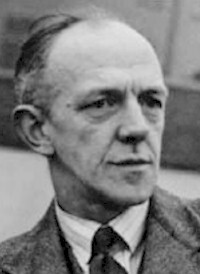 Arthur Cossons had taught at the school before his appointment as Head, but moved to take temporary charge of a forerunner of the new Junior School at Beeston Fields from 1929. 4Although not a pupil at Church Street, David Hallam remembers vividly a "reward" for a local history project undertaken in his primary school years - an afternoon spent with Mr Cossons, being shown his private museum at the school. Just one example of many who were inspired by Mr Cossons. 5The remains of the cross have now been set sensitively, by the developers, within a bay in the fencing around the old school building. It is lit at night, but, unfortunately, has not been supplied with an interpretive plaque. 7Where, incidentally, he was a contemporary of both David Hallam, owner of this site, and Ernest Pollard, author of The Pollards of Beeston. 8Neil's sister Hilda also took part in the expeditions with their father to discover historical traces in the surrounding area; her subsequent career in the museum service was clearly influenced by that experience.